MOSCOW. April 6 (Interfax) – The Russian Constitution does not require fundamental changes and any addition to the political system must not and may not affect human rights and the provisions on the form of government in the country, Prime Minister Dmitry Medvedev said. “I want to stress that no adjustments, no fundamental changes to the current constitution, which I spoke about in the article on the occasion of the constitution’s 25th anniversary, are necessary. 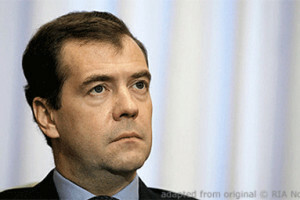 A constitution is a tool designed long-term for a stably developing country,” Medvedev told reporters on Saturday when asked to comment on Duma Speaker Vyacheslav Volodin’s remarks about changing the Constitution. “Society and the political system are developing, and this may raise questions about adding functions within certain institutions of power. “This is quite normal. I will recall that it was at my initiative, in 2008, that the presidential and parliamentary terms were changed and government accountability to State Duma was introduced. At the time those changes had been overdue and logically fitted into the state-political context. “Any new changes absolutely must undergo a stage of discussion, both by experts and within those structures of power. Earlier on Saturday Volodin proposed constitutional amendments allowing the lower house of Russian parliament to take part in consultations when appointing government members. “In my view, it would be good if the Duma were involved at least in consultations during the appointment of government members. This could be done through certain procedures, but they require amendments to the constitution,” Volodin said in an interview published on the Duma website. At the present time, the constitution stipulates that the Duma is involved in forming the government only through the procedure of giving its consent to a prime minister’s appointment by the president, Volodin said. In practice, the government is formed by the prime minister, and the president decides on the government’s composition based on the prime minister’s recommendations, “but without a chance to consider an alternative position or opinions on candidates,” he said. At the same time he said that it would be right to add a provision giving Duma the power to rate the performance of certain ministers. The 2008 amendments compelling the government to report its results to Duma annual were the right decision. The basic provisions of the Constitution are inviolable and it is obvious that in the 25 years of its existence much has been done, he said. “But as time progresses, new tasks of national developments require greater efficiency,” Volodin said.